Need a casserole recipe that’s hearty, yet elegant enough for entertaining? I highly recommend an Eggplant Timbale. Full of fresh, delicious flavors and wrapped up in thinly sliced, sautéed eggplant strips, this casserole looks like a beautiful present. It will impress your guests with both its looks and taste. Traditionally, this Italian dish includes ground beef and Italian pork sausage, but for a recent bridal shower I adapted the original recipe, which I found in a cookbook by Food Network’s Giada de Laurentiis, to be vegetarian. Stacked high with layers of roasted root vegetables, the dish is just as hearty and satisfying as it is with meat, and I think all the different colors of the vegetables–yellow, orange, purple–makes for an even more beautiful presentation. 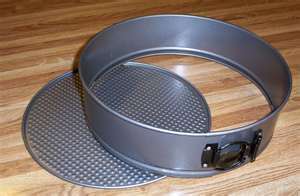 * Note: You will need a springform pan for this recipe, in order to make the pie shape of the casserole. While you can certainly make it in a regular casserole dish and it would taste just as delicious, I recommend using the springform pan if you are using this recipe for entertaining, as the pie shape is what gives this recipe its elegance. For this recipe, using a springform pan is key to a beautiful presentation. Start by washing and peeling your eggplants. 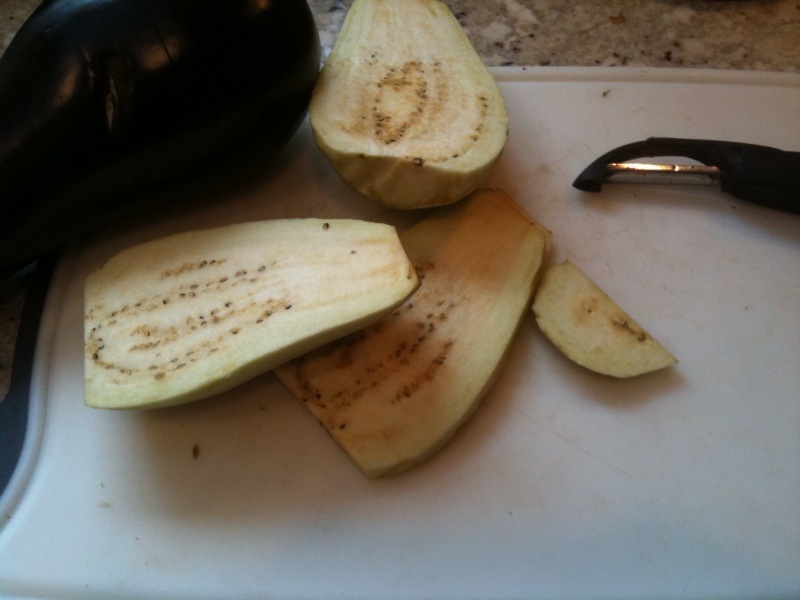 Then, slice the eggplants lengthwise into thin 1/4 inch slices. Lay the slices out on a clean towel and sprinkle kosher salt over them, then let them sit for 20-30 minutes while you prepare the other vegetables. Eggplants have brown seeds in them that contain a bitter liquid. 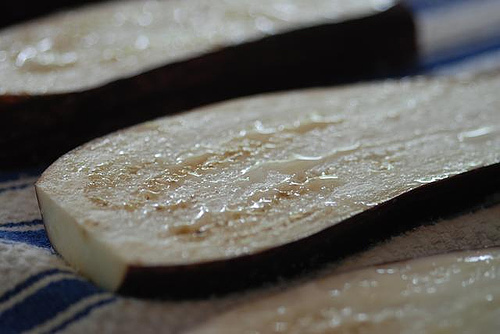 By salting or “degorging” the eggplant slices before you cook them, you can draw out the bitter moisture, leading to a better taste and firmer texture. You should be able to see liquid coming to the surface of your eggplant slices within 20-30 minutes after salting them. While your eggplant slices are degorging, you can prepare the other vegetables. 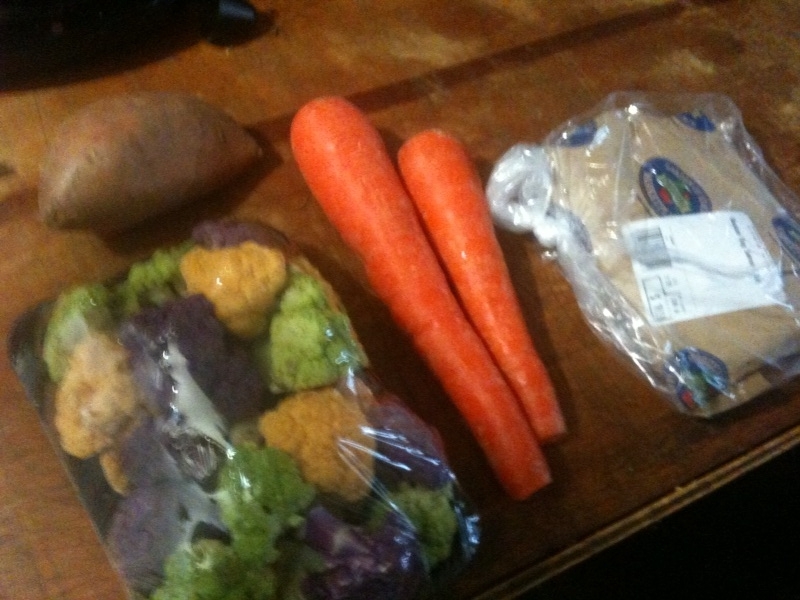 Wash and peel the sweet potatoes, butternut squash, parsnips, carrots, and beets. 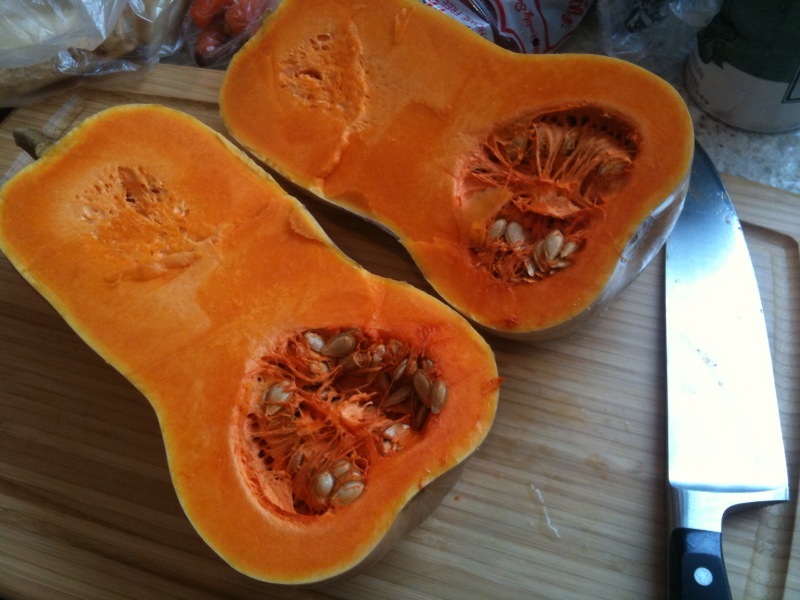 Then, slice the sweet potatoes and squash into 1/2 inch strips lengthwise, and slice the parsnips, carrots, and beets into 1/2 inch medallions. All the bright, vibrant colors of the fresh root vegetables make for a beautiful presentation when you serve a slice of this timbale. 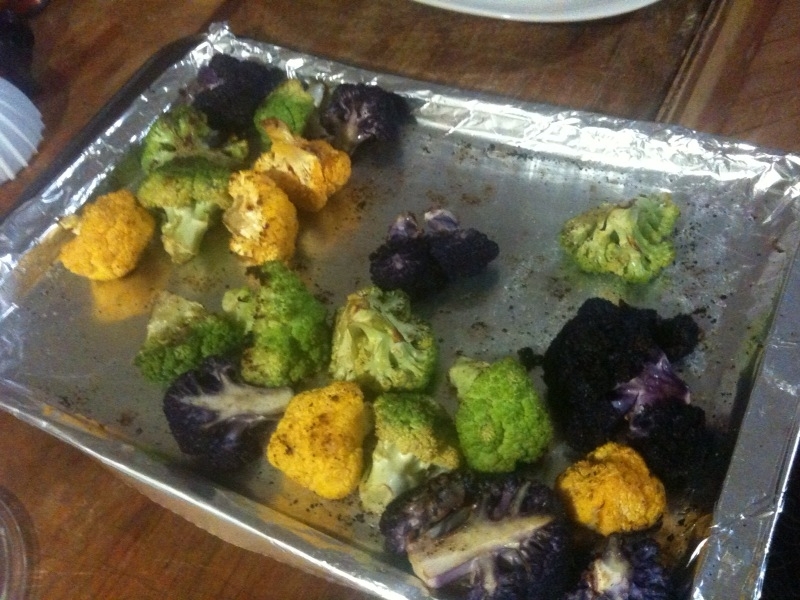 Roast the veggies: Put all your sliced veggies onto baking trays, drizzle with olive oil, sprinkle with salt and pepper, and put them into the oven to roast. This should take about 15 minutes, depending on your oven. Since the eggplants, which will form the “wrapping paper” on this casserole, are already salted because of the degorging process, you can go very light on the salt for the veggies. 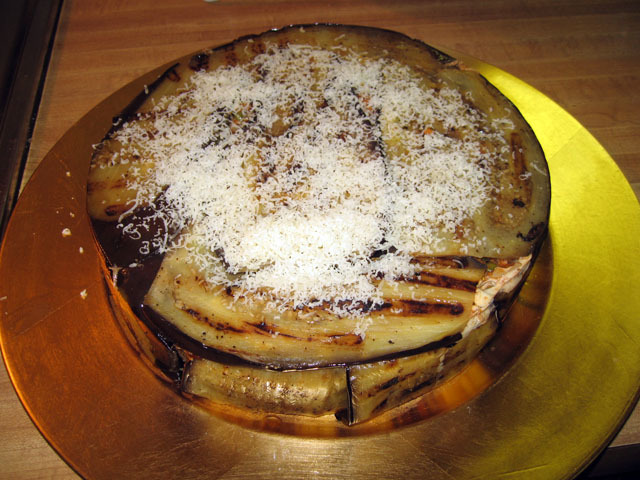 Saute the eggplant: If it’s been about 15-20 minutes, your eggplants should be ready to cook. With a paper towel, pat them dry, and try to absorb all the moisture you can. Place a medium-large nonstick pan over medium high heat and drizzle the pan with olive oil. When the pan and oil are hot, place 2-3 strips into your pan (depending on how many will fit comfortably) and saute the eggplant slices on both sides. As they cook they’ll become tender and slightly translucent. Cook the pasta: While your veggies cook, put a large pot of salted water on the stove and bring it to a boil. Add the pasta and cook until tender but still firm to the bite, stirring occasionally, 8 to 10 min. You want the pasta to be slightly more on the toothy side than al dente because when you put the casserole in the oven to reheat it, the pasta will cook further. 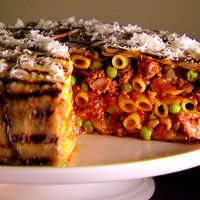 Assemble the Timbale: When your eggplants are sautéed, your root vegetables are roasted, and your pasta is cooked and strained, the timbale is ready to assemble. Start by brushing your springform pan with a little bit of olive oil, to ensure that the sides don’t stick to your eggplant when it comes out of the oven. Then, lay down strips of eggplant so they line the pan. Because the eggplant will form the “wrapping” on your casserole, you want to make sure that the slices overlap and hang over the edge of the pan, so you’ll have enough eggplant to fold over and cover the top of the casserole after you’ve added all the veggie layers. You may want to reserve a few sautéed slices to cover any holes in the top. 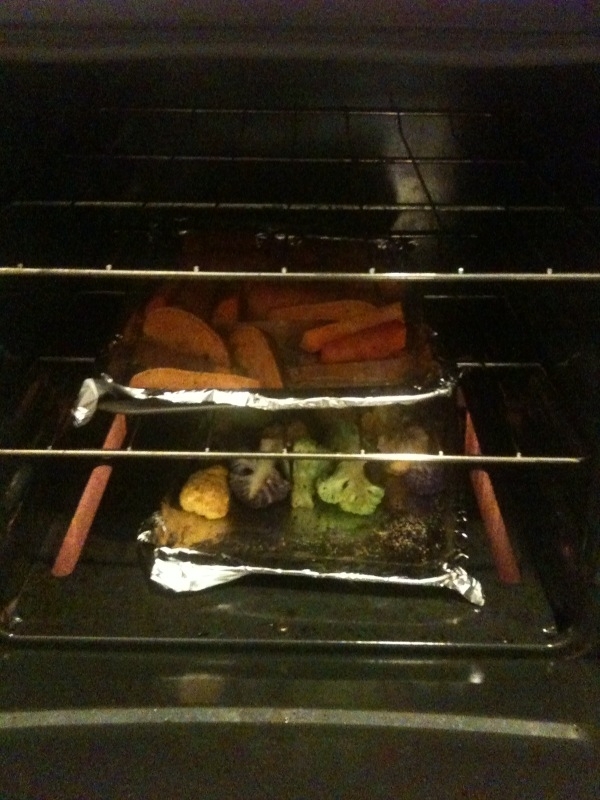 Add layers of veggies: When your eggplant liner is in place, add your roasted vegetables, one layer at a time. In between each layer, spread a very thin coat of tomato sauce, then sprinkle on a light dusting of the freshly grated Pecorino cheese, then add a few pinches of some freshly chopped basil. Before I add the sauce, cheese and basil, I always press each layer down firmly with the palms of my hands, to make sure there will be a nice tight fit. When you get to the middle of the casserole, add a layer of penne pasta which should have extra sauce and cheese. 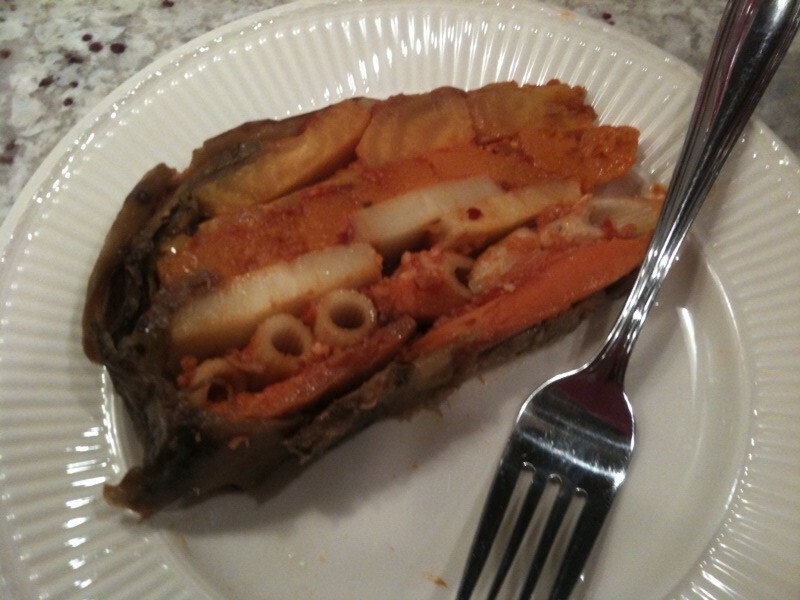 TIP: I like to alternate the veggies sliced lengthwise (sweet potato and squash) with the medallion shaped slices (beets, parsnips, carrots) to create an alternating color scheme and add structural support to the casserole–by alternating the lengthy pieces with the medallion ones, the casserole will keep its pie shape nicely and won’t collapse when you cut into it. Also, you don’t want to add too much sauce in between the veggie layers or else your casserole will be too mushy. 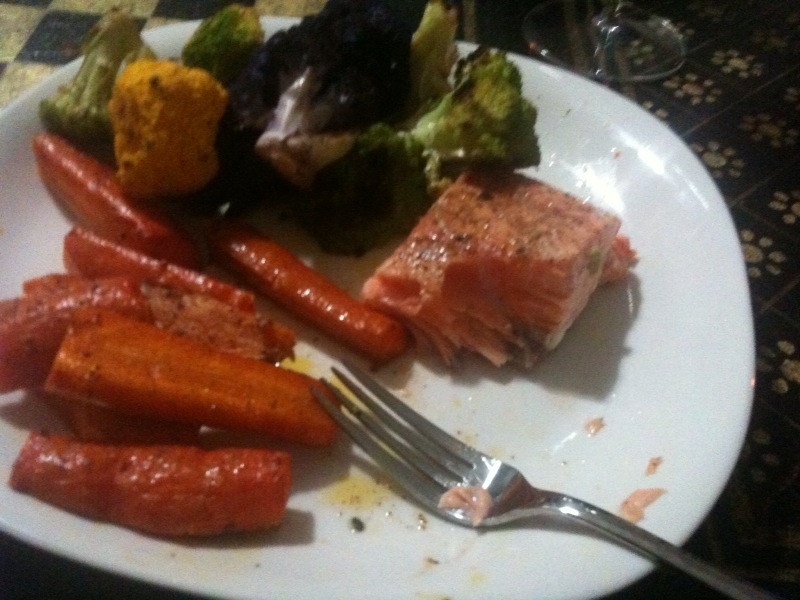 A slice looks so pretty on the plate--and tastes delicious! Reheat: When your layers are complete, fold over the eggplant slices, add another dusting of cheese. 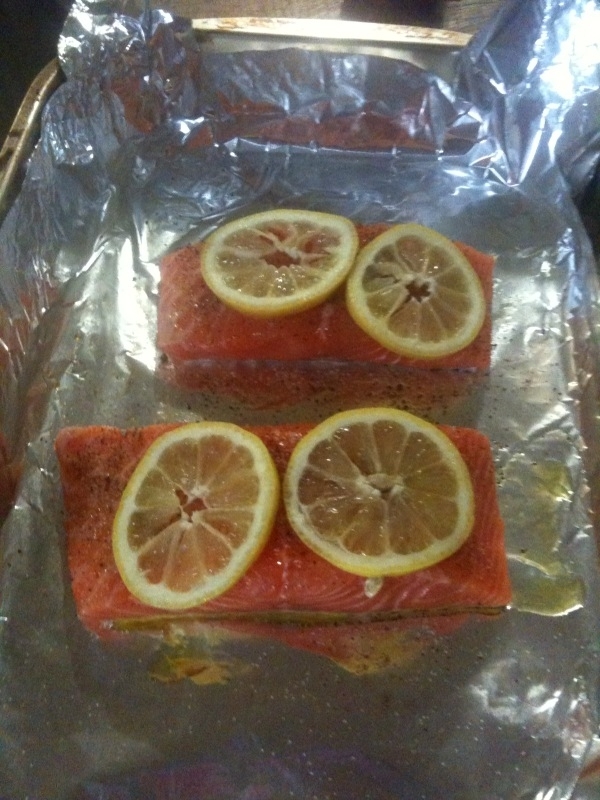 You can wrap it in aluminum foil and refrigerate for a few days until your party. To reheat it, put it into a 350 degree oven for about 30 minutes, until the timbale is warmed through and the cheese has melted. 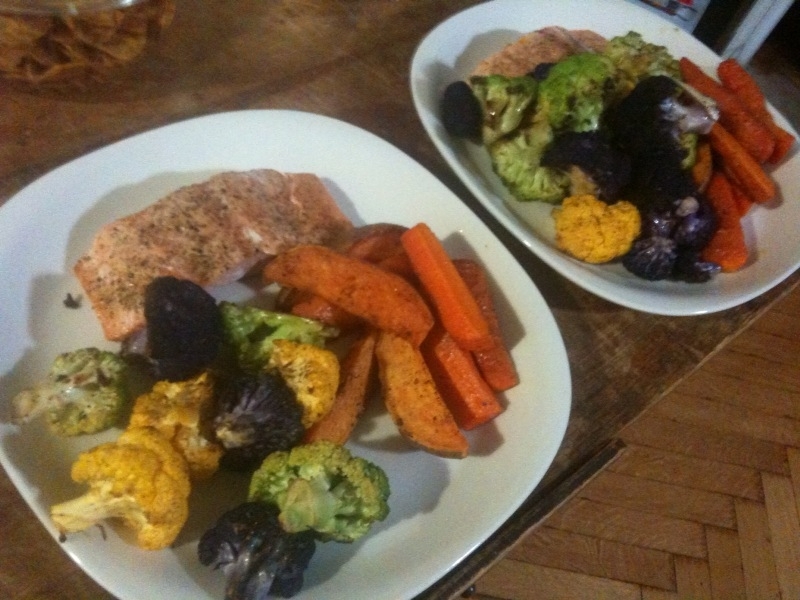 You’ll begin to smell the delicious aroma of the roasted, carmalized veggies–yum! 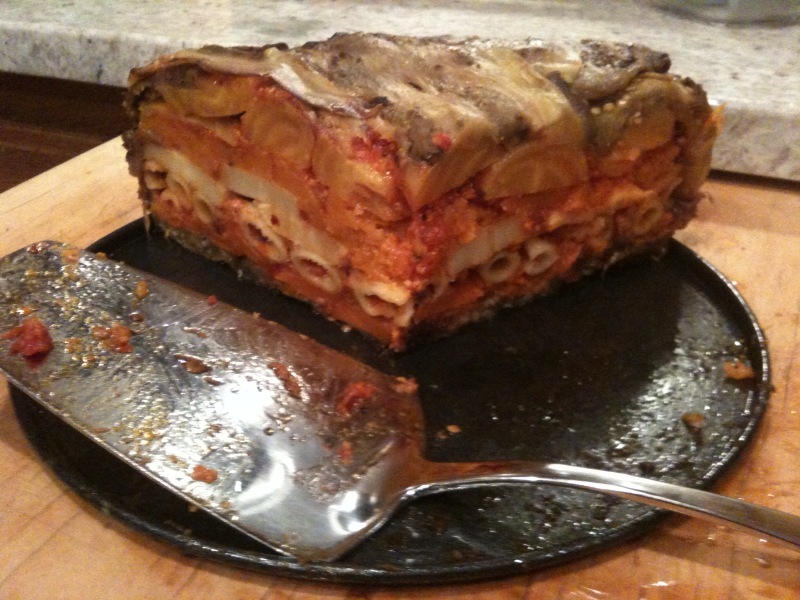 To serve: let the reheated Timbale rest for 10 minutes. 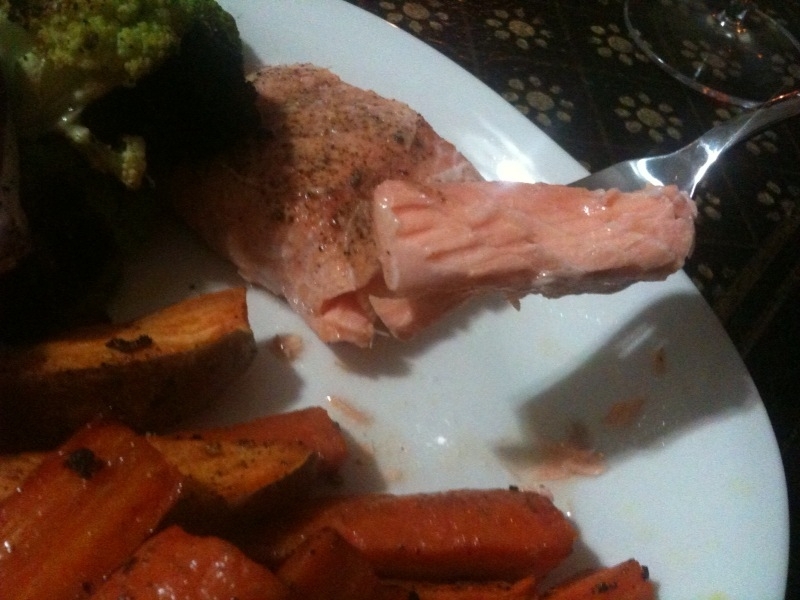 Then, unclasp the springform pan, and use a sharp knife to slice. Hopefully your guests will rave about the different flavors and the different colors that create such a beautiful presentation. There are lots of different ways you could modify this recipe–if you have a gluten-free crowd, don’t include the pasta layer. If you have a dairy-free crowd, skip the cheese or use a soy substitute. If you want the meaty texture of the original recipe but a vegetarian version, you can use Morningstar farm crumbles instead of the meat and pork sausage.